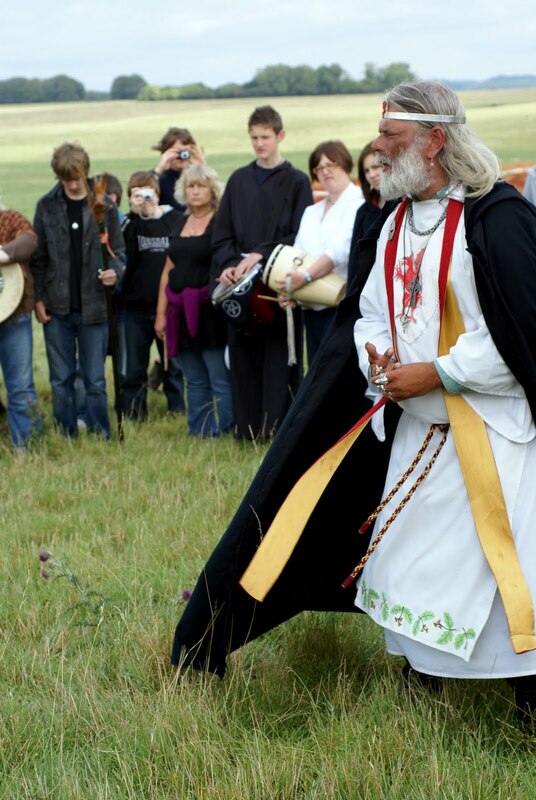 >Arthur Pendragon at Stonehenge – keep up the good work! I was up at Stonehenge yesterday and had the pleasure of meeting Arthur Pendragon. If you intend to vist the site please make sure you stop and support his cause. He has got 1000’s of signatures (from 60 different religions). You can always emasil your comments directly to him – see below. Keep up the good work Arthur, if pnly this country had more people like hime this would be a better place! THE “grave robbers”, sorry archaeologists, have been back this summer, theorising and arguing over the whys and wherefores of Stonehenge, and our televisions focus on how marvellous the ancients were who created it. But what of it now? Well, after spending £37 million and taking 11 years over public consultation and inquiry, our Government, like a petulant child, ignored all the findings and dismissed with the stroke of a pen all plans for road improvements in and around Stonehenge and forced English Heritage, the Government’s own watchdog looking after our national monuments, to begin anew with plans and public consultations. You may be forgiven for a feeling of deja vu, for we have indeed been here before. It has been described as “a step in the right direction…” by Robert Key, the Conservative MP for Salisbury. But I say it is a step backwards… back to square one. The current situation all-round is a rip-off. The tourists are being ripped off, as the current visitor centre is a national disgrace. What is supposed to be a World Heritage Site is served by temporary toilets and a prefab visitor centre that was temporary when it was built 40 years ago. The locals are being ripped off, too. They are not getting their road improvements. And anyone who thinks of Stonehenge as a sacred temple is being ripped off. Divorced from the sacred landscape, this once proud and majestic temple sits like a snared animal amid the tacky trappings of the 21st century. So what now? More rounds of talking shops and the inevitable “gravy train” of jobs for the boys, with English Heritage doing all it can to turn Stonehenge into a third-rate theme park with a visitor centre, cafe and all the other franchises and marketing practices that this entails. Perhaps it is time to return to the true spirit of the place. Scholars will argue over who built it and when, whether it was the proto-Druids or members of a very different faith. But one thing remains certain. It was people of great faith who erected the mighty stones. The logistics of such an operation, the transporting of the stones over such great distances, through the many domains of different tribal chieftains and peoples, would have needed enormous diplomatic skills and co-operation. The fact that it is still a place of reverence to certain beliefs shows an unequalled continuity of faith in what was once and still could be the Isle of the Mighty. Stonehenge was never a centre of commerce but of spirituality. The need for a visitor centre has been brought about in recent times by the way English Heritage has marketed it so aggressively both at home and abroad. Many people will remember when Stonehenge meant little more than a few ancient stones standing in the middle of Salisbury Plain. It should have been left like that. In recent times, it has changed from a place of spirit to a place of confrontation over freedom of access for religious observances at the solstices and equinoxes. A big thank you to all those who have bought a badge to support the new Stonehenge Picket, and the Arch Druids of Avebury, Cotswold and Glastonbury for their support. Many thanks to one and all and may your Gods look favourably upon you…..